On the 6th Day of Sugar my true love gave to me Decadent Chocolate Cheesecake . . .a chocolate and cheesecake lover’s dream come true! This dessert is most definitely a show stopper and will completely wow those lucky enough to get a slice. I’m not sure if there are enough words to adequately describe this cheesecake, but I’ll give it my best shot. 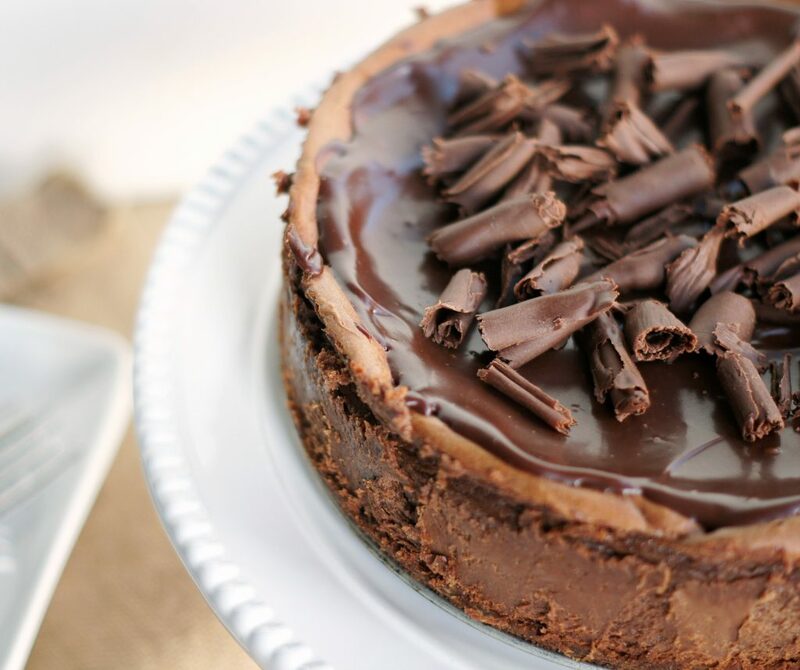 This cheesecake is rich, delectable, divine and absolutely scrumptious. 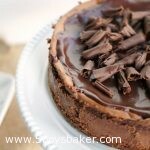 It has a buttery chocolate crust that is topped with a dark, rich, not-too-sweet chocolate cheesecake layer. Then, as if that weren’t enough chocolate, it’s topped with smooth, rich dark chocolate ganache and then garnished with beautiful chocolate curls. 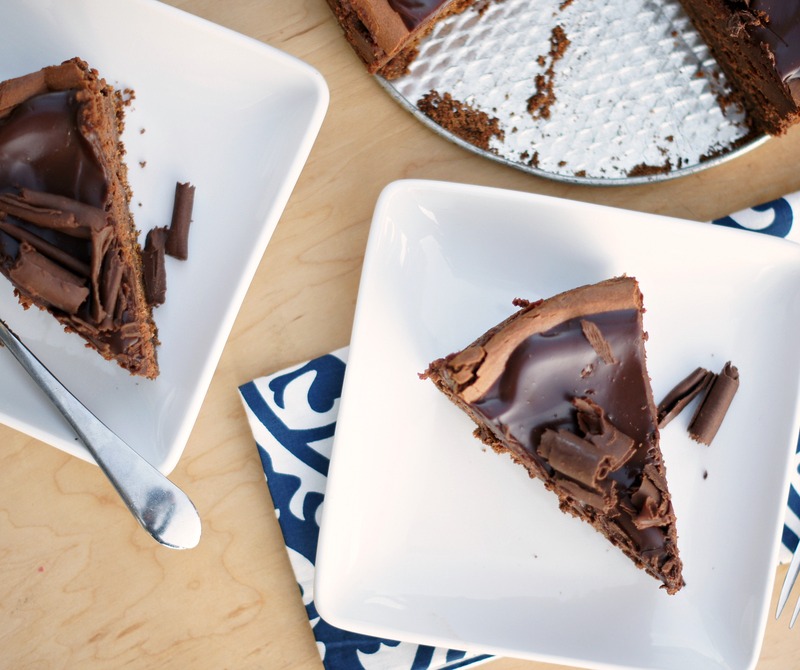 Are you in a chocolate coma yet or started salivating? If not, you should be. 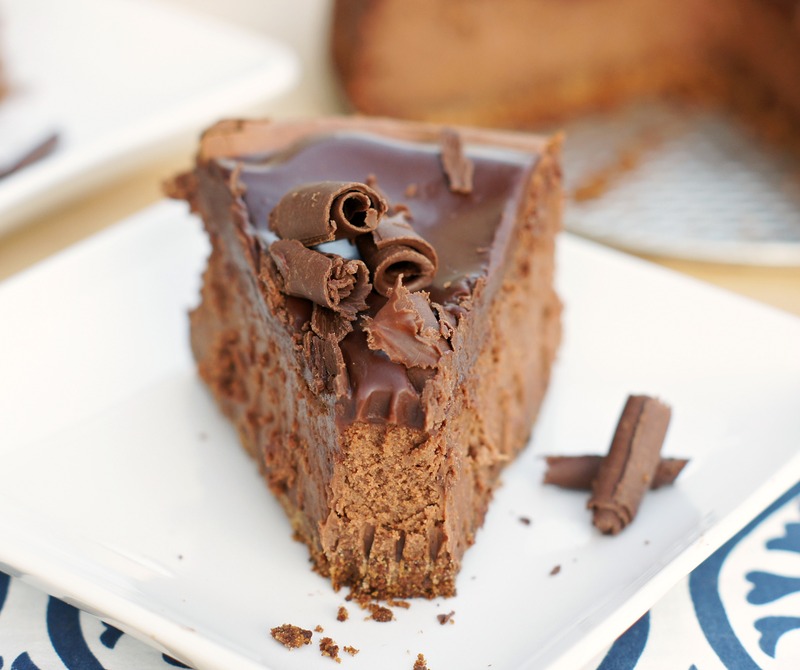 I can’t think of a better way to end a meal than a slice of this Decadent Chocolate Cheesecake. My life is complete now! For crust: Preheat the oven to 350°F. Butter a 9-inch springform pan with 3-inch-high sides (or use a 10-inch springform pan with 2-inch sides). Process the chocolate cookies in a food processor until they are finely ground. Transfer them to a small bowl and mix in the sugar. Add the melted butter and mix until well combined. Press the crumbs evenly onto the bottom only of the prepared pan. Bake just until set, about 5 minutes. Cool while preparing filling. Keep the oven heated at 350 degrees. For filling: Melt the 10 ounces of chocolate in the microwave or in a double boiler until melted and smooth. Cool the chocolate until lukewarm, making sure it's still pourable. In a large bowl (or with a stand mixer), blend cream cheese, sugar, and cocoa powder until smooth. Blend in eggs one at a time. Mix in lukewarm chocolate. Pour the cheesecake filling over the crust; smooth the top. Bake until the center is just set and just appears dry, about 60-70 minutes. Remove the cheesecake from the oven and cool on a wire rack for 10 minutes. Run knife around sides of the pan loosen it. Let the cheesecake cool to room temperature. Cover lightly with plastic wrap and chill overnight. For topping: One hour before serving (or up to 3 days ahead of time), stir cream, 6 ounces chocolate, and sugar in heavy medium saucepan over low heat until smooth. Cool slightly. Pour over the center of the cheesecake, spreading to within 1/2 inch of edge and filling any cracks. Chill until the topping is set, about 1 hour. When ready to serve, release the springform pan sides. Transfer the cheesecake to a platter. Top with chocolate curls. Make sure you plan ahead because this cheesecake needs to be chilled overnight. It can also be made all the way through the topping, covered and refrigerated for up to 3 days before serving.